1 anachronisms | This Blog Rules | Why go elsewhere? One of the big problems with making movies is that you pour your heart and soul in making a compelling film which will be your legacy to the world and some internet geek comes along and points out that your characters are wearing watches while battling with dinosaurs or eating pizza in the ice age. Never mind, here are 25 movies with obvious anachronisms to look out for. I always thought that writing the script for this film must have been a nightmare and it is certainly full of errors. 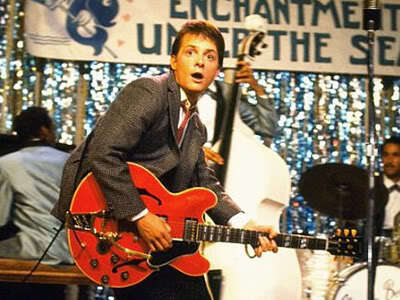 One clear anachronism is that Marty McFly plays a Gibson guitar which didn’t exist yet (no, he didn’t take it back with him).